Your lawn and landscape are extremely important parts of your property, so one of the biggest priorities is to keep it healthy and attractive at all times. A nice landscape is an investment that you want to enjoy for years to come. 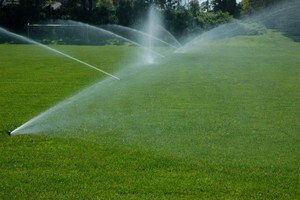 At Rainmaker Irrigation, we are dedicated to helping our clients maintain their properties in excellent condition throughout the year. We have the knowledge, skills, and experience to tackle any landscaping service you need in Milford. If you don’t already have a nice landscape, we can help you design and install a beautiful landscape that enhances and adds value to your home. You can always rely on us for quality workmanship and superior service. We understand how important the exterior of your property is to you. All of our Howell landscaping experts are seasoned professionals who provide high-quality workmanship and professional service. Give us a call today to ask any questions you have about the services that we provide, or to schedule your appointment for service. We’ll be looking forward to working with you! We begin each landscape design project by discussing the goals that the client has in mind for the project. Our Milford landscapers work with our clients directly to choose the perfect plants and other landscaping elements to create landscapes that are perfect for their home or business and their lifestyles. We work with you directly when you hire us for landscaping service in Milford. Whether you are looking to add an elegant garden path, create a new patio, or just maintain your lawn or garden, you can depend on our expert landscapers for excellent work. Lawns are an extremely important part of any landscape, but keeping up with property maintenance isn’t always easy. Our professional Milford property maintenance experts can help you keep your lawn healthy and attractive at all times. Whether you need mowing, trimming, fertilization services, weed prevention or removal, or seasonal lawn clean-ups, our professionals will always be ready and eager to tackle the job. If you are looking for a professional residential or commercial Milford landscaping company, please call Rainmaker Irrigation at 734-564-1373 or complete our online form.